Goldbaby Productions has released The Fat H3500, a free sample library for Kontakt and EXS24. I just purchased an Eventide H3500. This effects unit is simply amazing! I can see why it has gained legendary status. What I didn’t know… until I got one, was that it could actually generate its own sound. Plug in a midi cable and you can play it! The sound is produced by using short delays with feedback to create resonators which give a sound similar to a resonating string. Goldbaby has also released a free sample pack featuring the Juno-6 and UBK Fatso: The FatJuno-6 Drums and FX. 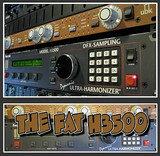 Both samples packs are available to download at no cost.